A convenient way to show and dispense brochures. Click here to download a product spec sheet for this item. Decorative Brochure Stand PLUS - Landscape.. 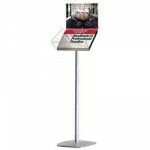 Decorative Brochure Stand PLUS - Portrait ..